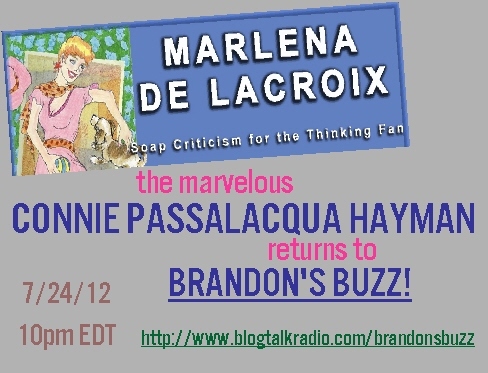 returns to brandon’s buzz! 7/24/12, 10pm e / 7pm p! So many musical love letters to the mysterious magic (and magnetic allure) of the Golden State, and whereas Joni Mitchell made hers bittersweetly poetic, and Dre and 2Pac made theirs an on-and-poppin’ party jam for the ages, Bethany Cosentino and Bobb Bruno travel a more nakedly straightforward route, taking special care to punch up the peerless practicality of the paradise life. (To wit: “We wake up / with the sun in our eyes / it’s no surprise / that we get so much done!”) A perfectly harmless summer treat which I hereby predict my Cali-‘shipping boyfriend is gonna slurp up with an overflowin’ ladle. I’m finally getting caught up with these girls’ batshit wacky reality series Still Holding On (which ran for seven incalculably crazy episodes earlier this year on TV Guide Network, and which has introduced me to my new favorite catchphrase, courtesy of über-Christian Chynna Phillips, who uttered some variation on it in every single installment: “When the Lord is on board, anything is possible!”). The series has been infinitely more entertaining than the new record — Dedicated , a collection of covers of their collective parents’ (the founding members of The Beach Boys and The Mamas and the Papas) most memorable material — the series was ostensibly designed to help promote, and that has sent me scurrying back in time to 2004 and to Dedicated‘s soothing, sterling progenitor, a terrific tribute to the music that made southern California the mecca for an entire generation of war-weary artists, musicians, and soul siblings searching for the promise of peace half a century ago. Summer is officially upon us, and while that abominable Ke$ha has apparently crawled back under the rancid rock from which she sprang (dare we pray forever and ever? ), women are still ruling the roost at pop radio, as we seem to be settling in for a stifling season full of Katy Perry (whose wholly unnecessary 3D concert film has landed in theaters with a resounding thud this weekend, although — full disclosure and all — I’m crazy about her sizzling new single, “Wide Awake”) and that brilliantly irritating import Carly Rae Jepsen (whose wafer-thin, inescapably catchy smash “Call Me Maybe” has been playing on a nonstop loop in our home ever since A stumbled upon the video, which makes me wish harder than ever that my domicile could come equipped with whatever would be the aural equivalent of a V-chip, so that only music I explicitly approve of would ever have the chance to pervade these walls). But summer 2012 promises to not be a total loss on the top 40 dial, ’cause Miss Nelly is blessedly back on the prowl, previewing her fourth English-language album with yet another adventurous, typically bombastic ball-buster that once again — as though we’d forgotten! — re-establishes Furtado as pop’s most nervy maverick. Think Adele meets Jack Johnson — with a peck of Wilson Pickett peppered in for garnish — if you absolutely must have a point of comparison. But there’s something wholly original about this kid, a twentysomething Brit ’bout to enjoy a massive breakthrough with his bracing and utterly lovely debut. A wrenchingly glorious triumph.